Finance – how do you find the cash to buy it? A decent sized (5kW+), good quality home solar power system can cost north of $6,000. That’s a big chunk of change to find. The solution – of course – is to buy a solar system on credit, or finance. Although we all like the thought of tiny power bills, we are also very wary of getting into debt; and so we should be. Debt incurs interest, which adds to our living expenses. I personally try and avoid it wherever possible. But solar finance is different. If it is used thoughtfully, a well financed, properly sized solar system can save you more money every month than it costs you to finance. Yes – even including interest. However, you need to shop around, not just for the solar panel system, but for the finance. The difference between solar saving you money each month and costing you will mostly come down to the deal you can get. If you see a finance deal that claims ‘no interest’ your BS detector should be going off. All finance has a cost – the “no interest” deals usually charge the installer a fee of around 15-25%. Invariably the consumer pays because, in our experience, 'no interest ever' solar finance deals usually come with a substantially higher retail price than a comparable self-funded system. You can get a much better deal overall by organising your finance independently and avoiding the easy-sign-up, ‘no interest’ deals. Interest free loans have long been a way merchants can take advantage of the mental shortcuts consumers take when making decisions. It can sound too good not to take up, but before you do we recommend you do the research first and compare your finance options. “Cash is not finance!”, I hear you say. But in order to compare the different financing options, you must compare them to the old fashioned way of buying things – with cash. If you are debt-free and have cash looking for a place to go, then investing in a solar power system will will give many other investments a run for their money. Solar systems currently generate a tax-free return that is higher than current bank interest rates or government bonds. If you use most of your electricity during the day, a 5kW system purchased for $6,500 will generally pay for itself in around six years. That’s a return of 12% per annum. If you’re not home during the day then the returns won’t be as spectacular, but still above bank interest rates. Who should consider paying cash? Anyone who has the savings and in particular cashed-up, debt-free retirees who want a higher return on their nest egg without taking undue risk. Tip: When comparing solar power with other investments, remember you can’t tax savings. What if you don't have the cash resources? Then one of these five financing options may suit you. At the time of writing (October 2017), most retail mortgage rates are between 4-5%. Considering the 12% return from home solar in the example above, you could be better off borrowing more against your home to invest in a solar system than to reduce your mortgage. If you plan to pay off your mortgage over 25 years, then the cost of your solar system could end up being almost double, once you take into account interest over time. Before you decide, you should compare the total cost of a home loan versus a short term solar loan. Be careful of big application or variation fees and any impact it might have on lender’s mortgage insurance. Who is this ideal for? Homeowners who have the financial discipline to pay off their mortgage as fast as possible. If you have an offset facility or redraw as part of your mortgage, then you can add the cost of a solar power system to your mortgage without incurring substantial fees that come with a new loan. Tip: Commit to paying more than the minimum repayment amount with your solar savings and see your home loan pay down faster. If you're looking to get great quotes for solar finance, we've teamed up with Parker Lane to make it really easy. Simply click here to be put in touch. It's quick, easy and free. If you’ve decided to not spend your cash, then the next best option for most is an unsecured personal green loan. Green loans are offered by financial institutions that understand a person installing solar panels is usually a good bet. Green loans often have lower interest rates than comparable unsecured personal loans. Some even come with rates more closely resembling a home loan than an unsecured personal loan. Green loans are only available to be taken out for approved green products; which include home solar systems from a Clean Energy Council Accredited installer, and must be paid directly to the installer upon receipt of an invoice. Setting up a new loan, whether it's an addition to your mortgage or a green loan, attracts a banker's best friend – fees. Watch out for establishment fees, monthly fees and early repayment fees that can add a significant amount to the total cost of your system. But if you look carefully, you can find a green loan with a low interest rate, long term options, low up front fee, no ongoing and no early repayments fees. Who are green loans ideal for? Most people who don’t have bad credit. Tip: For zero out of pocket expenses, speak to your finance provider about balancing estimated solar savings with a loan term to match the repayments. If you're considering seeking a solar finance quote, we’ve made this simple by partnering with Parker Lane, who offer a range of finance options such as the one described above and a easy, free process. Click here to be put in touch. In theory, 'no interest' loans enable you to buy solar and pay it off ‘interest free’ over time, but establishment, monthly and other fees can add up over time to act, in effect, as a small interest rate. 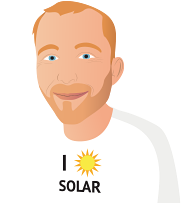 Finance companies that offer interest free repayment schemes receive a fee (typically around 15-25% of the price) from the merchant (in our case, the solar installer), which is where the real money is made. If you’re paying cash, the sticker price of a system may well be the same, but the merchant will be much more negotiable on cost than if you’re financing the purchase. 25% of the sticker price is more than what a typical solar installer will make on the sale. To make their margin, the installer may sell you an inferior inverter and cheaper panels, hurriedly installed in order to make a profit. The more likely scenario is they’ll have a high retail price of the system (in comparison with installers who don’t offer interest free deals) to cover the cost of offering you a solar payment plan. Buyer beware. The finance company now owns the debt, and is responsible for collecting repayments and ensuring that the loan is repaid. If you miss repayments, or are unable to pay the loan, then this could adversely affect your credit rating and ability to get credit in the future. Who is this ideal for? People with poor credit and who can afford higher repayments to pay the loan off over a shorter period. One of these companies boasts that they approve up to 96.5% of applicants (compared with 60-70% for the average lender). That's why the real cost of funding home solar this way can be so expensive – but if you have poor credit, you won't be eligible for a low cost green or personal loan. Tip: Think twice and be sure you can afford the purchase before you take up this finance option. Zero interest payment plans typically offer much shorter terms than green loans, which means your monthly repayments will be greater than your electricity bill savings in all but rare cases. With this option, the leasing company owns the system until you fully pay for it over the term of the ‘lease’. Unlike leasing a car, the solar power system can not be easily removed from your house and leased to someone else. If you decide to sell your house you will need to pay the outstanding balance of the loan because the contract cannot be transferred to the new property owner. The solar leasing salesperson will tout “just pay a simple monthly fee, which is often less than your current electricity bill.” In theory you come out ahead, but beware of the actual interest rate that is baked into the monthly lease. Compare the cash price of the system you are buying to the total amount you will pay over the term of the lease. The difference is in effect the interest you pay to enjoy the benefits of solar energy now while paying later. Don’t be fooled by the low monthly payments that are in theory covered by the energy savings from solar panels. Who is this ideal for? We only recommend this type of financing for larger solar systems, typically put on commercial premises. Tip: Always compare the total cost of every finance option you are considering. Repayments for a long term solar loan may well be as low as the lease payments. Many Australian solar companies got very excited about this concept a few years ago, but it has failed to take off for financing residential solar systems. The idea is you get the system installed for no upfront cost, then pay the solar company for the power a system generates. For example, they could charge you 20c per kilowatt-hour of solar electricity generated compared to the 30c you typically pay for grid electricity. Sounds like a no-brainer, right? Unfortunately, there is one flaw. Under a PPA, you are contractually obligated to buy a set minimum amount of electricity from the retailer, regardless of whether or not you actually need it in your home. This means you could potentially be paying for energy that you don't need. Solar PPA's are popular are for commercial properties and factories that use loads of electricity during the day, which means almost all the solar electricity is used on-site. But unless you own a factory, PPAs are probably not a good solution. Who is this ideal for? We only recommend this type of financing for larger solar power systems, typically installed at commercial premises. Tip: If you run a home business that uses a considerable amount of electricity through the day, seven days a week, then a PPA may be suitable for you. Just be sure to check your electricity consumption patterns to be certain you will come out ahead. A finance company can help those who can’t borrow more on their home mortgage, or want the added incentive of a higher interest rate to ensure they repay the loan faster. If you don’t have the discipline to repay more than your minimum repayments, then a personal loan may work out as a cheaper option in spite of the higher interest rates. Similar to green loans, some lenders will factor the loan purpose, your home ownership status and other aspects, and may offer better than market interest rates. A finance company will pre-approve your loan, allowing you to negotiate as a cash buyer and ensuring you can get the best system for your money. If you decide to sell your property, then the loan is unaffected as it is guaranteed by you personally and not tied to your house. Who is this ideal for? Those with good credit who want the flexibility to fund items other than solar, a competitive interest rate, and the negotiating power of a cash buyer. Tip: Your bank typically won’t offer a competitive interest rate because their pricing is one-size-fits-all. This means you’re paying the same rate as the 19 year old student borrowing the cash to go backpacking around South America. If you want quotes for solar finance, we’ve made this process even simpler by partnering with Parker Lane, who offer a range of loan options similar to the one described above and a free and easy process. Simply click here to be put in touch. SolarQuotes has made the process of securing solar finance simple by forming a partnership with Parker Lane, who are experts in solar financing options and offer a range of competitive loan options similar to the ones discussed in this article. If you would like to be put in touch with Parker Lane to discuss your options, simply click here. Disclaimer: This page does not constitute financial advice. Peacock Media Group Pty Ltd recommends you seek independent financial advice before signing any contracts. What time of day suits you best for a conversation? For finance, what is your biggest priority?